A lot of popular YA fiction is published in the United States. So what about British stuff? This week we highlight three UK titles soon to be released, by three popular authors. Enjoy! We’ve ordered some new stuff (as we do), some so new they don’t have covers yet. This week we’ve discovered a couple of realistic fiction titles that look like really good reads. We’re also anticipating September, when the next Throne of Glass book and the sequel to one of the best books of 2015 will arrive. 22.03.16 | Permalink | Comments Off on Love NZ books? We have some very lovely new fashion books and I’ve noticed a bit of a theme going on – illustrated biographies on the legendary Coco Chanel! They are really pretty and also whimsical, so I am totally down with this theme. The only difference is that one of these books is pitched at 5 year olds! Ha!! But honestly, it is such a sweet and pretty (and informative!) book that you won’t even care. Our other new Chanel book is by fashion artist Megan Hess and is très chic; you can have a gander at her other art here (she also published this book, of which I am a huge fan.). Coco Chanel : the illustrated world of a fashion icon / Megan Hess. Grey Haward has always detested the Chemists, the magicians-come-scientists who rule her small western town. But she has always followed the rules, taking the potion the Chemists ration out that helps the town’s people survive. A potion that Grey suspects she—like her grandfather and father—may not actually need. By working at her grandfather’s repair shop, sorting the small gears and dusting the curio cabinet inside, Grey has tried to stay unnoticed—or as unnoticed as a tall, strong girl can in a town of diminutive, underdeveloped citizens. Then her best friend, Whit, is caught by the Chemists’ enforcers after trying to protect Grey one night, and after seeing the extent of his punishment, suddenly taking risks seems the only decision she can make. But with the risk comes the reality that the Chemists know her family’s secret, and the Chemists soon decide to use her for their own purposes. Panicked, Grey retreats to the only safe place she knows—her grandfather’s shop. There, however, a larger secret confronts her when her touch unlocks the old curio cabinet in the corner and reveals a world where porcelain and clockwork people are real. There, she could find the key that may save Whit’s life and also end the Chemists’ dark rule forever. (Goodreads). First lines: The chemist came just before closing. Granddad shot Grey a warning look as he hurried to the front of the store. Time to make herself unnoticeable. As if that were possible. That’s when she gets a visit from the kind but mysterious apparition she calls “Grandmother,” who tells her: “You have three months to save him.” The next night, under the stadium lights of the high school football field, she meets a beautiful boy named Beau, and it’s as if time just stops and nothing exists. Nothing, except Natalie and Beau. (Goodreads). First lines: The night before my last official day of high school, she comes back. I feel her in my room before I even open my eyes. That’s how it’s always been. London, April 1812. On the eve of eighteen-year-old Lady Helen Wrexhall’s presentation to the queen, one of her family’s housemaids disappears-and Helen is drawn into the shadows of Regency London. There, she meets Lord Carlston, one of the few who can stop the perpetrators: a cabal of demons infiltrating every level of society. Dare she ask for his help, when his reputation is almost as black as his lingering eyes? And will her intelligence and headstrong curiosity wind up leading them into a death trap? (Goodreads). First lines: In the sun-warmed quiet of her uncle’s library, Lady Helen Wrexhall spread the skirt of her muslin morning gown and sank into the deep curtsey required for Royal presentation: back held straight, head slightly bowed, left knee bent so low it nearly touched the floor. And, of course, face set into a serene Court smile. First lines: Westie had left the valley at dawn to head home. The sun had risen soon after and followed her throughout the day. By four it just felt spiteful. Though her skin was burned and blistered, she preferred the sun over darkness during her travels. First lines: The first time I killed a man it was an accident. He didn’t have any identification on him. He was white, probably in his mid-fifties. Average build, average height. Smoker. No tattoos or distinguishing scars. His fingerprints matched those found at a thirty-year-old crime scene in North Dakota: a family murder, both parents, son and two daughters, all killed one night at the dinner table. Nobody was ever arrested. First lines: Death. This carriage was taking me straight to my death. First lines: The last thing we did as a family was bury my sister. That makes this meeting even harder to face. I don’t have to be a psychic to know what everyone thinks when they look at me. Why did she do it? Why didn’t I? And the thing is, after all that happened, I’m not sure I know to the answer to either. First lines: They all had their terrors. The new girl believed that spiders lived in her veins. Her screams sliced through the darkness, passing through the thin walls of Grace’s cell and filling her brain with another’s misery to add to the pressures of her own. First lines: Rosa is pushing all the buttons. She makes the seat go backwards and forwards, the leg rest up and down, in and out, lights on, lights off TV screen up, TV screen down. We’ve never been in business class. Rosa has to explore everything and figure out what she’s allowed to do and how to get away with what she isn’t. First lines: She searches for the smell. She finds it- the sweet perfume of a Murraya bush in summer. It’s the only memory of her grandfather and it’s still exactly as it was. She is sitting on his knee in an old green kitchen. A loose thread hangs from his singlet. Winding it around her finger, she listens to him speak. First lines: Everyone in town knew the coffin was empty. I think that’s what packed the pews – the pure curiosity of the thing. They didn’t come for love or admiration. Nope. They came for the show. They came because it was big news. A juicy scandal that jolted our small southern town like spikes of summer lightning. In our latest batch of Young Adult fiction orders we found a cool short story collection, the beginning of an interesting-looking fantasy series, and there was a suggestion to buy the new John Corey Whaley book, which we should get in May! A Tyranny of Petticoats: 15 Stories of Belles, Bank Robbers & Other Badass Girls. This is a collection of short stories with a catchy title. Features stories by Marissa Meyer (The Lunar Chronicles), Elizabeth Wein (Code Name Verity), Marie Lu (Legend and The Young Elites), Beth Revis (Across the Universe), and many more. “From an impressive sisterhood of YA writers comes an edge-of-your-seat anthology of historical fiction and fantasy featuring a diverse array of daring heroines,” says goodreads.com. 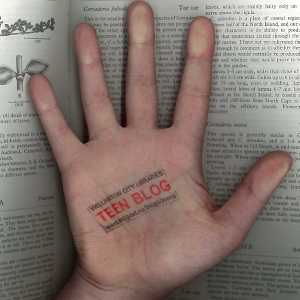 Read Teen Vogue online for free! 08.03.16 | Permalink | Comments Off on Read Teen Vogue online for free! 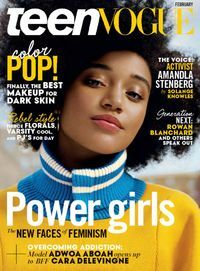 You may already know you can read magazines for free using Zinio with your library card, and we just added some new titles to our collection, including Teen Vogue! Not only can you read it online, but there’s a year of back issues you can read too! Once you download them, you never need to return or delete them (unless you need more space on your tablet or phone, of course). 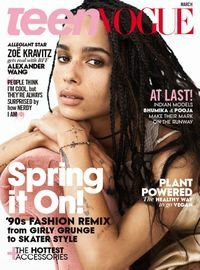 Find out how to get started with a Zinio account here, or if you already have an account, go here to look at the online issues of Teen Vogue!